Intimidation Clothing along with ProAm Belts are pleased to announce a new contest for MMA, boxing, pro wrestling promoters and grappling tournament event coordinators. The contest, which runs from July 1 through July 31, 2013, will award the lucky winner a free co-branded Intimidation Clothing (@IntimidationMMA) belt made by ProAm Belts (@ProAmBelts). To be eligible, the promoter or event coordinator must have an event scheduled after August 18th and be willing to make both Intimidation and ProAm Belts a sponsor of their next event. In addition, those who enter agree that should they win they will also provide photos of the belt inside their cage/ring and rights to the photo for Intimidation and ProAm Belts for promotional purposes. The contest is open to anyone with a scheduled MMA, boxing, pro wrestling or grappling event as well as event coordinators for other combat sports events and is open to promoters in the USA and Canada only. 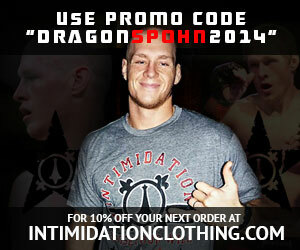 To enter, please fill out this form, on the Intimidation Clothing promotional web site. The winner will be selected and announced the first week of August. ProAm Belts, a leader in the industry supplying MMA & boxing championship belts, provides MMA, boxing and pro wrestling promotions with custom and stock belts to fit any budget. Intimidation Clothing is pleased to announce that the company will be releasing a new Mark “The Pride of Bloomfield” Cherico signature tee this summer and pre-order sign-ups are already underway. The first true signature tee from Intimidation for the popular product of Fight Club Pittsburgh, Intimidation Clothing released a women’s tank top style in the Summer of 2012 shortly after first signing Cherico to an exclusive sponsorship deal. Now, just days before the biggest fight of his life as he takes on UFC veteran Donny “Eagle Eye” Walker at Pinnacle FC 3 near Pittsburgh, Pennsylvania, the Intimidation brand add to their line of premium quality t-shirt and training gear. The design features a skeleton in the classic Mark Cherico pose with the Italian crown and flag prominently displayed with his nickname “The Pride of Bloomfield” as the dominant front graphics and text. In addition, Intimidation will donate $5 from every shirt sold to Connor’s Crusade. With the addition of his own signature tee, Mark Chercio becomes just the 12th athlete with their own Intimidation branded shirt. As stated on the company’s official Web site, “Intimidation Clothing is not a brand that makes signature shirts for just any fighter. Only championship level pros are eligible for a signature tee as we look to keep high standards at all times.” Other fighters with their own signature shirt from Intimidation include UFC Hall-of-Famer Ken Shamrock, current UFC Welterweight “Relentless” Roger Bowling, Bellator Middleweight Brian “The Predator” Rogers, #1 ranked female fighter Jessica “Evil” Eye, UFC vets Jason Dent, Forrest Petz, Wes Sims, Donny Walker and more. Intimidation Clothing’s Mark Cherico women’s tank top is also for sale at IntimidationClothing.com. The new Mark “The Pride of Bloomfield” Cherico signature tee is currently available via pre-orders online at IntimidationClothing.com under the “Signature Shirts” link and a signup sheet will be available at Pinnacle FC: Pittsburgh Challenge 3 in Cannonsburg, PA on Saturday, June 29th at the Intimidation booth. Shirts will be on a first come, first served basis and will be shipped to all pre-order buyers in late July 2013. PRESS RELEASE – Ashtabula County continues to be tied to the sport of Mixed Martial Arts (MMA), and two of Ohio’s most popular and successful fighters will once again be paying a visit to Andover this week. Brian Rogers and Jessica Eye will speak about bullying and how to treat others on Thursday, May 23rd at Pymatuning Valley Middle School. Both fighters, who both train out of the Independence, Ohio based Strong Style Martial Arts, are also sponsored by locally owned Intimidation Clothing. Rogers and Eye will address the bullying topic and provide words of motivation for two groups of fifth through eighth graders on Thursday, May 23rd at Pymatuning Valley Middle School in Andover, Ohio. Neither fighter is a stranger to public speaking as Eye regularly speaks to fans across the nation at events in Ohio and Texas and Rogers is a former teacher by day in Kent, Ohio. Both athletes were joined by Dr. Rhadi Ferguson in March 2012 at PVMS which drew significant media attention. The event will begin at 9:00 am ET in the PVMS gymnasium. Brian Rogers (10-5, 3-3 Bellator) is a Middleweight fighter (185 lbs) out of Strong Style Martial Arts in Independence, Ohio, and has fought for the Northeast Ohio NAAFS and UCB promotions. A two-time Bellator Middleweight Tournament semifinalist, Rogers has received incredible attention over the past year after his highlight reel KO of Vitor Vianna at Bellator 61 in March 2012 which aired on MTV2 and has since received millions of views on Bellator highlights on Spike TV. Rogers is expected to return to action sometime later this year as he looks to make another Bellator Middleweight Tournament appearance with an eye on the promotion’s 185lb title. Jessica Eye (9-1, 3-0 Bellator) fights in the Women’s 125 lb division and also fights out of Strong Style Martial Arts in Independence. Recently ranked #1 in the world in the women’s 125lb weight class, Eye continues to be one of the most popular fighters in Ohio and will return to action on June 1st for the NAAFS. Tickets for NAAFS: Fight Nite in the Flats IX in Cleveland are still available for the June 1st event at NAAFS.tv as Eye will face Carina Damm in the night’s main event. Fans, online shoppers and those interested in selling Intimidation products can find out more information online by visiting the Intimidation Clothing’s official Web site: http://www.intimidationclothing.com/. Fans can also learn about new shirt designs, contests and fighter sponsorships by liking Intimidation Clothing on Facebook or following the brand on Twitter @IntimidationMMA. With strong, creative and bold themes and affordably priced products which can fit anyone’s budget, Intimidation is fast becoming a leader in MMA-themed apparel and looks to build their brand nationwide from right here in Ashtabula County. Since just before her pro debut in 2010, Intimidation Clothing has been supporting the career of Jessica “Evil” Eye (9-1). A budding star in women’s MMA who is ranked #1 in the world at 125 pounds, Eye is coming off the biggest win of her career, a 58 second submission of Bellator’s former women’s 115-pound champion Zoila Gurgel at Bellator 83. The win placed Eye on a long list of Intimidation sponsored fighters scoring highlight reel finishes on a national stage. Unbeaten in the Bellator cage with a 3-0 record, Eye is riding a six fight win streak as she is set to face Munah Holland at Bellator 95 in Atlantic City, New Jersey. A product of the Strong Style Fight Team, Jessica Eye (@JessicaEvilEye) trains alongside many of the top fighters in Ohio including UFC heavyweight Stipe Miocic, Bellator middleweight Brian Rogers, UFC vets Forrest Petz and Jeff Cox, and regional MMA stars Nick Duell, John Hawk, Joe Heiland and more. The longtime member of Team Intimidation, Eye has also headlined three cards for the popular Intimidation-sponsored NAAFS organization. The Intimidation brand and Jessica Eye reached an agreement on Tuesday to extend and expand upon their previous sponsorship deal. Not only will Eye sport the Intimidation logo when she steps into the Bellator cage well into the future, but it is expected that a new Jessica Eye signature tee will be released in the coming months as well. Intimidation Clothing is a fast-growing brand of MMA apparel & training gear based in Ohio with a strong presence throughout the Midwest USA and a growing national presence. The Intimidation brand is regularly featured on multiple sporting events on SpikeTV, AXS TV, SportsTime Ohio, MTV2, FUEL TV and EpixHD as well as MMA highlight shows on Spike TV and HDNet/AXS TV. In addition to over 80 styles of high-quality, bold t-shirts and sweatshirts for men, women and children and is also known for their premium-quality EliteFighter MMA board shorts. Intimidation Clothing products can be found for sale online at IntimidationClothing.com and fans can follow the marketing wing of the company on Twitter, Intimidation Interactive Media, @IntimidationIM. Follow Intimidation Clothing on Facebook and @IntimidationMMA on Twitter. (PRESS RELEASE) COLUMBUS, Oh. – Ultimate Victory Challenge, LLC is proud to announce an expanded partnership with Intimidation Clothing to serve as a title sponsor for all UVC mixed martial arts events through the 2013 calendar year. With the agreement, UVC and Intimidation Clothing will use cross-branding promotions to further extend the reach of both organizations. Intimidation Clothing began a relationship with UVC in 2011, and that agreement expanded in 2012, when the Ohio-based apparel company served as a title sponsor for “UVC 20: Clash at the Coliseum” in August. The biggest event in UVC history, Intimidation also sponsored main card fighters Luke Zachrich, Nick Kraus, Jon Washington, Doug Kulbis, and Rob Hanna, along with several amateur fighters. “I am very pleased to continue to work with and expand our relationship with the UVC. The Intimidation brand always looks to partner with classy, reputable organizations and, in my opinion, Rick Pyles and his staff are some of the finest individuals in the MMA industry today,” said Intimidation Clothing CEO Luke Jernigan. This expanded partnership begins with UVC 21 in October and will continue through 2013. Ultimate Victory Challenge, LLC is the premier promoter of mixed martial arts (MMA) cage fights in Central Ohio. Founded in 2008, UVC operates under direction of the progressive Ohio Athletic Commission and has held 20 events to date. UVC has featured many of the area’s top fighters, including Luke Zachrich, Lance Palmer, Victor O’Donnell, Julian Lane, Jon Washington, and Matt Lanning. UVC is a family-friendly MMA experience that puts fighters first. For more information on UVC, visit www.UltimateVictory.org. Intimidation Clothing is a fast-growing brand of MMA apparel & gear based in Ohio with a strong presence throughout the Midwest USA and a growing national presence having been featured on multiple events on MTV2 and HDNet in recent months. In addition to over 70 styles of high-quality, bold t-shirts, the company is also becoming known for their premium-quality EliteFighter MMA board shorts, as well as vale tudo shorts, rashguards and more available online at IntimidationClothing.com. Fans can like Intimidation Clothing on Facebook and follow the Intimidation brand on Twitter. Intimidation Clothing is pleased to announce the completed acquisition of the Northeast Ohio-based MMA apparel company Soulless Clothing. Makers of t-shirts and hoodies for MMA and extreme sports enthusiasts, Soulless Clothing has been a staple in the Northeast Ohio MMA market since 2008 sponsoring 2-time NAAFS Amateur Champions George “Bonesaw” Comer and more. Soulless is best-known for their top-selling styles including the “Spine” and the George Comer signature tee entitled the “Bonesaw.” While the financial terms will not be released, part of the deal includes increased distribution of remaining Soulless Clothing products through Intimidation’s strong list of sales channels. Intimidation Clothing has already confirmed that Soulless shirts and hoodies will be available at the Intimidation booth at NAAFS: Combat Challenge 22 in Akron, Ohio on Saturday, September 22nd as well as at future events that the Intimidation brand sponsors. In addition, Soulless Clothing ‘s chief designer Randy Ashburn will join Intimidation’s creative staff for select design projects. Intimidation Clothing is pleased to announce their sponsorship of the upcoming Association of Boxing Commissions (ABC) Approved MMA Judge and Referee Training Seminar in Overland Park, Kansas. Hosted by Bellator Television Commentator Sean Wheelock, the seminar will take place on August 4th and 5th at the Overland Park Convention Center in Overland Park a suburb of Kansas City, Kansas. MMA Referee and ABC Approved Trainer Rob Hinds will serve as the instructor for both training seminars. Mr. Hinds has over 4,100 MMA bouts of refereeing experience in the UFC, Bellator and other top promotions. The seminar is being held under the approval and sanctioning of the Kansas Athletic Commission (KAC), and Commissioner Troye Blackmon will be in attendance on both days. The Association of Boxing Commissions (ABC) draws its membership from state and tribal combative sports commissions from the United States and Canada. The ABC is the governing body for MMA and Boxing in the USA and Canada. Intimidation Clothing is a fast-growing brand of MMA style apparel & training gear based in Ohio with a strong presence throughout the Midwest USA and a growing national presence regularly being featured on multiple sporting events on MTV2, FUEL TV, EpixHD and SportsTime Ohio as well as MMA highlight shows on Spike TV and HDNet. In addition to over 60 styles of high-quality, bold t-shirts, the company is also becoming known for their premium-quality EliteFighter MMA board shorts, as well as vale tudo shorts, rashguards and more available online at IntimidationClothing.com. Fans can like the Intimidation brand on Facebook and follow Intimidation on Twitter. In less than three years time the Intimidation brand has emerged into one of the most respected and successful brands on the Midwest MMA scene. Once seen as an Cleveland brand, Intimidation Clothing has made strong efforts to expand the company’s reach hitting other Midwestern cities like Chicago, Columbus, Cincinnati, Detroit, Minneapolis and more. A title sponsor of the North American Allied Fight Series (NAAFS) and their SportsTime Ohio programming, the Intimidation brand is regularly seen across the globe on MTV2 and EPIXHD as well as on MMA highlight shows on HDNet and Spike TV. Creative, savvy marketing, great relationships and quality products have built the brand into a force to be reckoned with in the MMA industry and a rapidly growing lifestyle brand. Built with the help of a successful Internet Marketing firm, Intimidation Clothing has used basic and advanced online marketing principles from day one. But in recent months the Intimidation brand has expanded their advertising efforts running ads on ESPN Radio and Fox Sports Radio programming throughout Northeast Ohio and Western Pennsylvania. “With Fox broadcasting free UFC events on the radio it is a perfect way to advertise our brand to the large number of UFC fans,” said Luke Jernigan, President & CEO of Intimidation Clothing, LLC. The radio ads and a variety of traditional and internet radio interviews with Jernigan have helped the brand gain awareness in a variety of markets. This is coupled with a large number of fighter sponsorships both on the national stage and throughout the Midwest on the regional MMA circuit. From a MMA cutman to logos inside the cages of many of the top MMA promotions in the Midwest and sponsorships of fighters across the region, the MMA world is seeing the Intimidation brand over and over again at different venues in different cities, week in and week out. With plans to continue expansion into other complementary industries already underway, the MMA world is not the only focus and the company will certainly continue to seek creative ways to get the brand name out there to the masses. “Intimidation Clothing has been a great partner for the NAAFS and more importantly for our fighters,” stated NAAFS President & CEO Greg Kalikas about the impact of the Intimidation brand. A veteran of the karate world and MMA promotion business with well over 100 events under their belt, the NAAFS is one of the top regional MMA promotions in the USA constantly producing top-level MMA talent and first class events. For Intimidation Clothing the quotes above are not about what the company has done, but more about what the company is about. “Whether we are talking about an intro level amateur or a UFC veteran, I value each fighter’s contribution to this sport,” stated Jernigan. “We have customers who I can remember what they bought a year ago and fighters who I can quote who they fought, when and where without blinking. We pay attention to detail and make people feel important, something all of us want in life, to feel important. The awesome part is we do not have to change or be fake to do this – this is how I was raised and how this company will continue to be built.” This was further proven in a recent thread about fighter sponsorships on the MMA Underground Forums at MixedMartialArts.com when UFC Heavyweight Shane Carwin and others shared their positive experiences with the Intimidation brand. One of the most valuable components to the make up of Intimidation Clothing as a company is the many connections inside the MMA industry. “While our relationships are strong with a large number of fighters and agents, they are just as strong with many of the top MMA promotions in the Midwest. As a regular sponsor of NAAFS events in Ohio & West Virginia, UVC events in Columbus, Ohio, Colosseum Combat North of Indianapolis, the XFO in Chicago and SEG/Driller Promotions in Minneapolis, Minnesota, our name is regularly heard in a variety of strong markets,” said Jernigan. Add a strong, growing presence in Pittsburgh & Erie, Pennsylvania, and throughout Kentucky and Michigan as well as along the East Coast and the company’s growth strategy is clear.